We are closed on Sundays and Mondays and some of the national holidays. Tours are available at other times for 5 or more people, with prior notice. The building that houses the Chase County Historical Society Museum and Library is located at the corner of Broadway and Friend Streets. It is one of 9 places in Chase County which has been entered on the National Register of Historic Places, this building being entered on November 9, 1977. The two-story building, constructed of native stone, was built in 1882 and was originally used as the Chase County National Bank which continued in business until 1928. The building was used by several businesses in the years following. In 1976 it was purchased by the Chase County Historical Society for use as a museum, library and office. There are two floors of exhibits. On March 31, 1931, the plane carrying famous football coach Knute Rockne and H.A. Christen, J.H. Happer, W.B. Miller, Charles A. Robrecht, Spencer G. Goldthwaite, Robert Frye and Jess Mathias, crashed near Bazaar in Chase County. losing all lives. There is a display of artifacts and original pictures from the crash site. Other pictures, data and newspaper accounts of that tragic day are also available in our library. The schoolroom depicts school as it used be. Old school books, high school annuals and pictures are here. This is one of two antique organs in the museum. 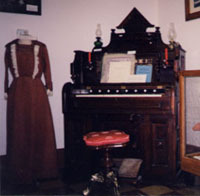 This one is believed to be the first organ brought to Kansas. It arrived in Chase County in 1863. This "Chamber of horrors" is a dentist's office of years ago, complete with all the tools of the trade. This display contains memorabilia of the E.C. Roberts family of Strong City, who are known worldwide in Rodeo circles. Much of the equipment of Ken and Gerald Roberts, both World Champion cowboys, is displayed in the National Cowboy Hall of Fame in Oklahoma City. Their sister, Marjorie Roberts Hart, was posthumously inducted into the Cowgirl Hall of Fame in Hereford, Texas. The chaps shown here are those worn by Emmett Roberts during the years he was a "pick-up man" at the Strong City Rodeo, which he founded. Also displayed is the No 1 belt buckle of the series minted to celebrate the 50th Anniversary of the Strong City Rodeo in 1987. Near the Roberts Family display is "The Old Barn", showing equipment used by our farmers and ranchers in days gone by. Chase County is the home of the book "PrairyErth", written by William Least HeatMoon. The boots the author wore and the walking staff he carried as he walked across Chase County are in the museum, plus other "PrairyErth" memorabilia. There is an array of pictures of each town in Chase County which were taken in the days when each was a thriving, busy town. 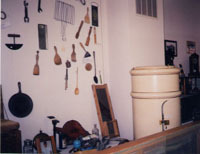 A display of old kitchen tools that "made life easier". Also, a round refrigerator, sporting a lazy-susan shelf. 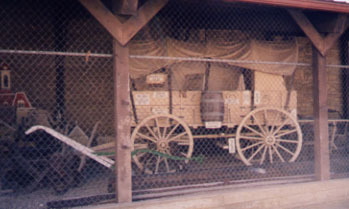 Outside and to the rear of the building is a display containing a chuck-wagon used by one of the local ranches, and a stone burr mill, once used to grind grain into flour. The "burrs" which are two large flat stone disks, came from a quarry in Northern France famous the world over for its product. This burr-mill was used for many years on a local farm. 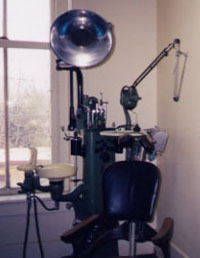 The Historical Society Library contains a copier, a reader, a reader-printer, and has microfilm of all newspapers that have been published in Chase County. These are for your use. Volumes 1, 11 , III, IV of Chase County Historical Sketches contain history of Chase County families and the account of some of the events that took place in the formation of the county. These volumes are available for study or to purchase. We also have listings of all the cemeteries in the county, and marriage licenses dating back to 1860, for your use, obituaries, genealogy and research materials, many photos, etc.